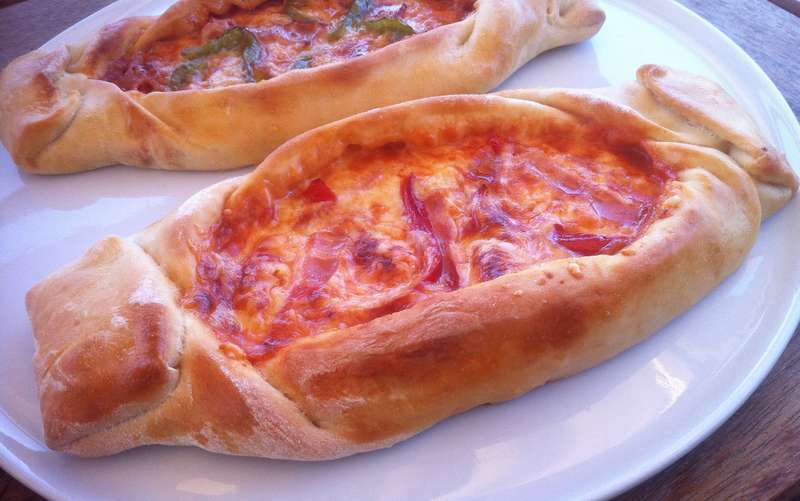 The very best traditional boat-shaped Greek pizza recipe! Boat-shaped Greek pizza or Peinirli / Peynirli is a traditional dish that was brought by the Greeks who lived by the Black Sea almost 100 years ago. This Greek pizza recipe is a different take on the traditional italian pizza or calzone. Italian pizza has a thin and crusty base, but for this Greek pizza recipe you will need a more fluffy and thicker base which will help keep your ingredients in place once you fill the peynirli. Unlike the traditional Italian pizza or calzone, this Greek pizza (Peinirli) is shaped like an open top boat with folded ends and its key ingredients deliciously melt in the middle. (See the pictures below). For the topping of this Greek pizza recipe try experimenting with any ingredients you like or you have laying around. Traditionally peinirli is made with kasseri, a Greek cheese that is salty, soft textured, stringy rather than crumbly and chewy and usually it contains no tomato sauce. But the good thing is that one can find Peinirli that can contain just about anything. From simple ham and cheese to eggs to mince meats (beef, pork, chicken). So feel free to improvise! So go ahead, put down that delivery menu and amaze your friends and family with this super easy Greek pizza recipe! Oh and you can always read this delicious recipe in Greek here Λαχταριστά σπιτικά Πεϊνιρλί Συνταγή. Coat lightly the dough with some olive oil, place the dough inside a large bowl and cover with plastic wrap. Let the dough sit in a warm place for at least 30 minutes, until it doubles it’s size. Take the dough for your Greek pizza out of the bowl and split in 6 evenly sized portions. Stretch out the dough and shape in oval shaped, thin portions, like a pizza base. For the topping for this Greek pizza recipe, grate the cheeses on top of the stretched out dough and fold the dough corners to form its crust (see pictures below). Make sure you squeeze the ends so that the dough sticks together and doesn’t unfold when baking. Fold the bottom edge first. Secure the edges by pressing them firmly or sealing them with a bit of water. Start folding the upper edge in the same way you did for the bottom. And lastly fold the two ends creating a boat-shaped pizza with raised edges. These will keep your ingredients in place. Cut the bacon and peppers in little strips. Add the bacon and peppers on top, spreading them evenly. Preheat oven at 180C and bake the peinirli for 20 minutes. Remove from the oven and let the peynirli cool for a few minutes. Enjoy! !